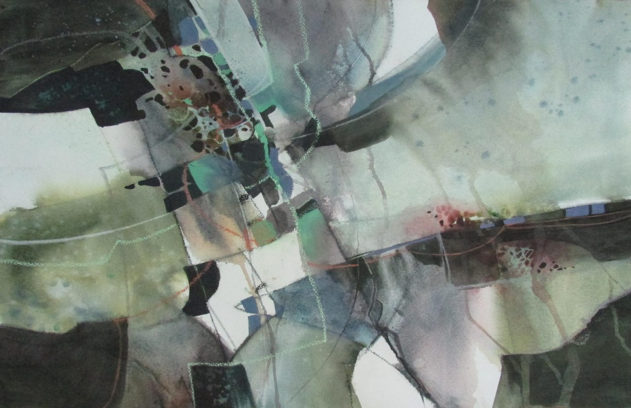 Kathleen Scoggin is a contemporary abstract artist working in watercolor, acrylic, and mixed media. 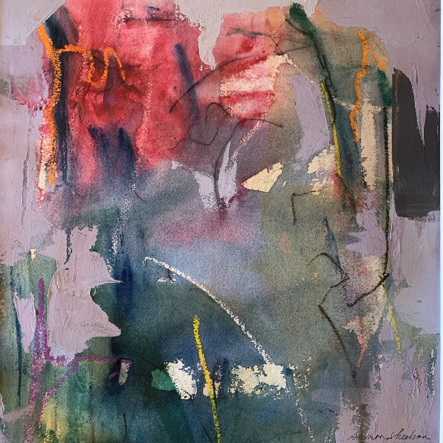 Her work is inspired by nature and expresses organic subjects. 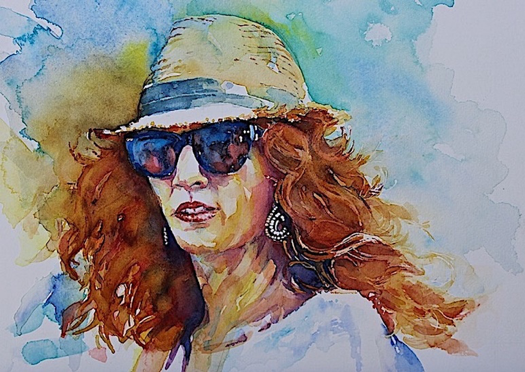 San Diego Watercolor Society, Artist Council Exhibition – Palm Springs Art Museum, Watercolor Society of Oregon Fall Transparency Show, Pacific Northwest Plein Air Show, Oregon Society of Artists Rose Festival Art Show. Lake Oswego Visions Invitational, Lake Oswego, Oregon. 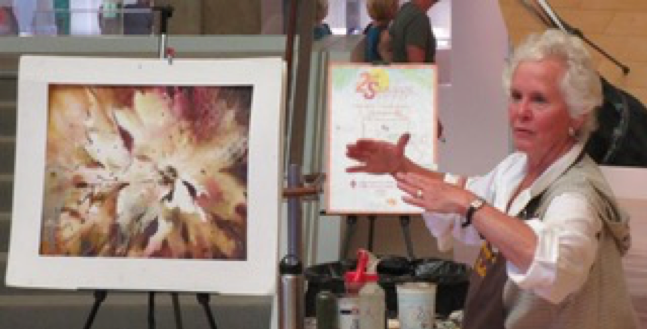 Numerous workshops from nationally recognized Artists. I was attracted to this painting when I first saw it – it’s a very appealing painting. There’s balance in its asymmetry, and a lovely complementary color palette. There’s good line work, wet into wet blending, and soft and hard edges. 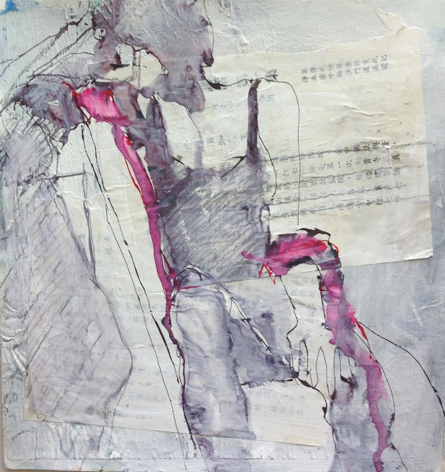 I like that it’s different – it’s loose and juicy with texture from the collage. It’s not all clearly defined. There’s lost and found edges and has some mystery about it. I don’t want the artist to tell me every last detail about the work. I like that there’s just a little bit of color. A powerful painting. Gorgeous complementary colors with great neutrals. There’s a wonderful division of space. The major shapes are all connected, and the colors are repeated in an important way. It’s a beautiful design. I’m choosing this painting as the Best of Theme, “The Language of Art,” because it’s a classic watercolor painting that clearly tells a story of the people and their boats. It has a beautiful composition with a nice division of space. The shapes are linked and overlapping to further tell the relationship of the subjects. It has a beautiful complimentary color palette. This painting demonstrates how good composition can tell a story very well along with an appealing subject matter. 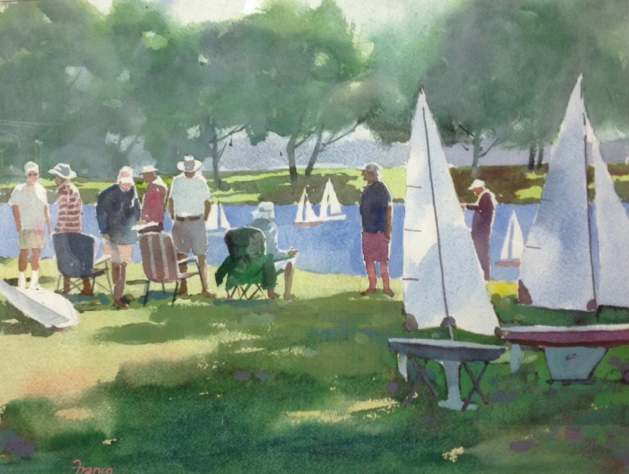 This painting stood out – it has a strong composition and demonstrates a great facility with the watercolor medium. It uses a beautiful limited palette which holds the painting together. The placement of the shape on the page is gorgeous. It gives the viewer a feeling about who this person is. The values are great, with the lightest light right up against the darkest dark. The shapes point right to the person’s face. It’s a beautiful painting. I want to be on this hill standing among those sheep! I love that there’s not a ton of detail in this painting, but the shapes are connected together in an interesting way. 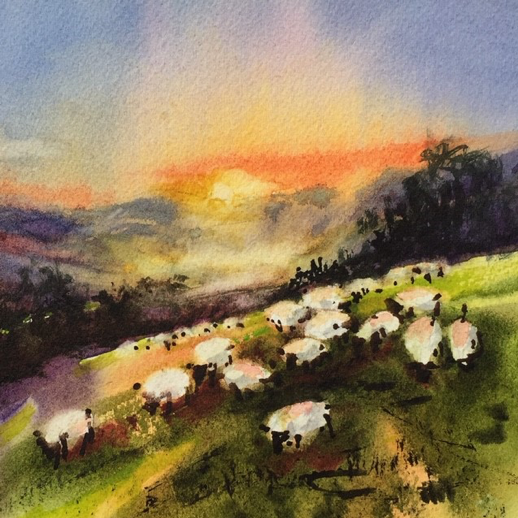 The sheep in the foreground gives an asymmetrical balance to the painting. The color palette also helps pull the painting together. I love the sloping lines of the landscape. It’s a very happy painting. 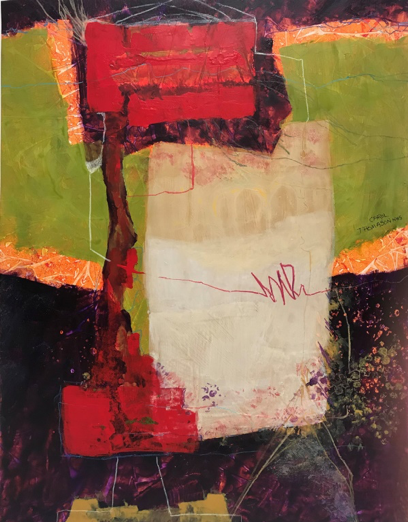 This entry was posted on Tuesday, April 2nd, 2019 at 7:45 pm	and is filed under Member News, Shows / Exhibitions. You can follow any responses to this entry through the RSS 2.0 feed. You can leave a response, or trackback from your own site.